With the assistance of a New Jersey Department of Environmental Protection Watershed Grant, CU Maurice River contracted educational consultant Christine Raabe to coordinate the compilation of lesson plans to address main elements that distinguish the NJ Delaware Bayshore region. A teachers’ advisory group composed of educators from the Bayshore region developed the lesson plans for this document. The guide was first formulated in 2001. 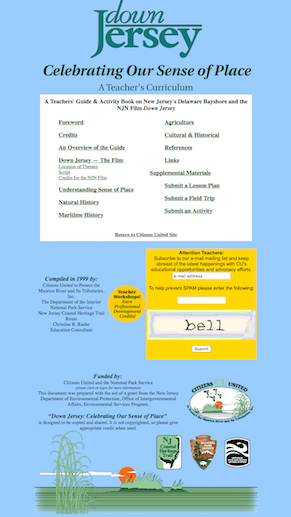 In 2002 it took first place in the category of Education and Learning Institute, NJ DEP, Division of Watershed Management for the documentary Down Jersey and Down Jersey Celebrating a Sense of Place – A Teachers’ Curriculum. Originally more than 500 teachers participated in workshops on the curriculum. Rutgers’ geography department felt that the curriculum should be required statewide! Today the material remains relevant and many teachers still use the lesson plans. Check out the online version; click here.